Their revamped blog, chickdowntown on twitter (where you can get more contest news), YouTube, their MySpace page, and chickdowntowntv.com. These days an online store has got to be seriously connected online, right? Drawing held on Friday noon, entries taken till then. US only, sorry! Sizes available are 25 - 31. And check out Danz's chickdowntown.com giveaway at her blog, but hurry, her giveaway ends tonight at midnight! I'll enter all commenters unless otherwise specified. Good luck! aww i love katy the best! Love Current Elliott and so happy I finally got my loved destroyed skinnies. The boyfriend style is also amazing!!! May the best girl win. Oooh, I would love to have these! ooo please enter me to win!! These are so stinking amazingly cute! I want some! I think Katy is their best choice! Thanks for posting this one Miss Fashion! And their new site looks excellent! Please enter me into your contest! Love the jeans -please include me. 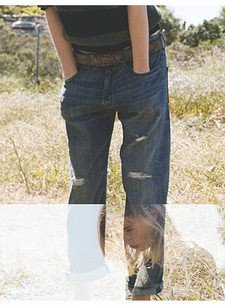 I have been coveting these Current/Elliot jeans! Count me in! Oh ...thanks for the link to the chickdowntown site. I have a new vintage clothing site and use models, so the behind the scenes action was mesmerizing..I picked up a few tricks too! Loved Courtney the redhead. Thanks for including us all in the giveaway! Please enter me! Luckily I think I got in just under the nick of time! I loved Julie. I'm so excited! Great Giveaway!! Please enter me!! i just tried these on at barneys the other day. whoever wins should know they need to ask for their size... TWO sizes down! i tried on my normal size and was able to take them off without unbuttoning or unzipping. oooo pretty please enter me!! i so want elena to win! and so does everyone else!! Hi there-such a great giveaway, good luck to all the US bloggers! Can I enter the contest if I hate chickdowntown.com? I'd love to be entered into this giveaway! I liked Julie the best so that means 2 entries for me. Amazing giveaway! would love em! eeps - major thanks, as usual a font of shopping info. sounds like when I wear my "husband" jeans, for real. sister wolf - of course! but i thought you hated boyfriend jeans? still entering you of course. thanks to all for entering! drawing tomorrow at noon. I really like these- please enter me! I like Katy best- thsi is my #2 entry! Thanks so much for the generous giveaway...I would be SO thrilled to win! I really like the model Katy. How cute! Thanks for this contest! I definately want elena to win. Such a nice giveaway, pity it's just for US readers. I'm sorry. I just hate everything at the moment. I just want to be a Winner. I could sure use a new pair of jeans and these are very cute! Thanks! Please, please, please, pick me! those jeans look so comfortable and fashionable. I love the looser cut, it's nice to see any non-skinny jean on the market - such a refreshing treat! Awesome, I would love to win this, I would gift them to someone special and be the Best Aunt in the World. I would love to win these! They look very comfy!